When he became the lone holdover in President Barack Obama’s Cabinet, Gates found himself in the rare position of being able to shape the new administration’s first defense budget in a way that would have been impossible if Obama had chosen a new defense secretary. 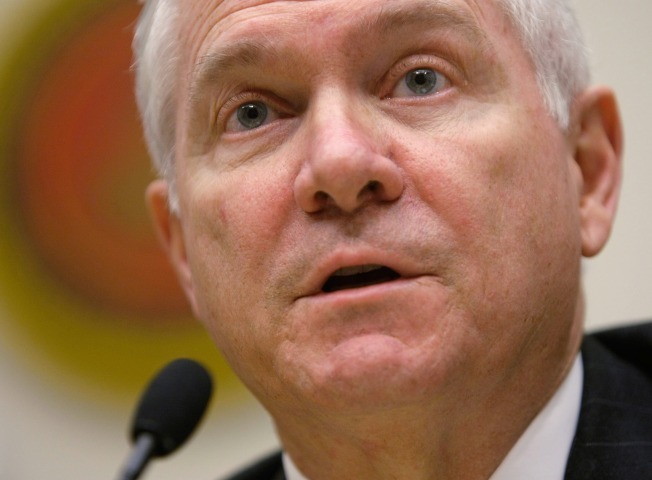 When he came in as defense secretary during the Bush administration, Robert Gates defined his job as fixing the war in Iraq. Now he is attempting to do something far more complex: refashion the Pentagon budget for the next war. The $534 billion blueprint released by Gates this week proposed curtailing several major weapons systems, which has prompted cries of protest from lawmakers whose states are likely to lose jobs. But that outcry has largely obscured something more significant that Gates did with the budget: He laid out for the first time the Obama administration’s perceptions of the most pressing threats it faces abroad and how it intends to deal with them. In doing so, Gates is taking sides in the debate over the size and scope of future conflicts — advancing the idea that the next U.S. war could resemble both a conventional war and an insurgency at the same time, a so-called hybrid war that would make some of those big weapons systems so prized in Congress obsolete. The fact that Gates is at the center of this debate is in many ways a surprise, even to him. He rarely devoted much attention to the budget for the first few years of his tenure. He didn’t expect to be around long enough to restructure what the Pentagon buys. He didn’t have Rumsfeld-like ambitions to “transform” the military. He expected to leave the Pentagon at the end of the Bush administration. But when he became the lone holdover in President Barack Obama’s Cabinet, Gates found himself in the rare position of being able to shape the new administration’s first defense budget in a way that would have been impossible if Obama had chosen a new defense secretary. Gates decided to begin the planning necessary to position the military for this different type of conflict, one that military strategists are calling a hybrid war. It’s a term that has taken hold at the Pentagon over the last year as strategists have studied how war has evolved even since the U.S. invasion of Iraq. That is not exactly the enemy the U.S. has been battling in Iraq and Afghanistan, which are both much closer to pure insurgencies than the hybrid wars that Gates is describing. But it’s not hard to find a potential foe in the Middle East that might use a combination of conventional and unconventional tactics in a war with the United States. Iran is the country with the most capability to fight in this way, military strategists say. The chances of a U.S. military strike against Iran has certainly diminished since Obama took office, and Gates himself has made clear that he favors exhausting diplomacy, sanctions and other non-military steps as the U.S. searches for a way to halt what it contends is Iran’s pursuit of nuclear weapons. Yet the Pentagon also sees its job as planning for the worst-case scenario, which a hybrid war with Iran might well be. It has a conventional military, which though considered mediocre in many respects, possesses high-tech weapons, including cruise missiles and air defense systems. But Iran also has the ability to strike using unconventional tactics, including terrorist strikes around the globe, stepped-up support for insurgents in Iraq and Afghanistan, and with waves of small speed boats attacking U.S. naval ships in the Persian Gulf. In a war with Iran, “you would have to destroy the Iranian air force and negate the missile threat. You’d also have to deal with Iranian small boat attacks, and you’d also have to be prepared to deal with terrorist attacks,” said Andrew Exum, a fellow at the Center for A New American Security, a Washington think tank, and a former Army officer who served in Iraq and Afghanistan. Gates also grew concerned that the lessons the military was learning in Iraq about what it took to succeed against an insurgency would be shunned as those wars wound down. He worried that the Pentagon bureaucracy, Congress and major defense contractors would return to what they felt most comfortable doing — preparing for large-scale conventional war. If future wars are likely to be hybrid wars, the Pentagon has to prepare for fighting conventionally and unconventionally at the same time, Gates says. He is quick to point out that the budget recommendations he laid out this week hardly represent a radical shift away from buying large high-tech weapons systems. But it was about as much as the hidebound military services and their defenders on Capitol Hill could possibly stand in their jealously guarded weapons programs. And it will take considerable pressure to keep Congress from restoring many of the cuts. The changes Gates is seeking in most cases appear to be driven at least as much by the fact that several major weapons systems he is proposing to cut have gone wildly over-budget, making them unaffordable as the defense budget shrinks in coming years. The plan would halt the Air Force’s F-22 fighter after buying 187 of them, terminate the Army’s high-tech Future Combat Systems vehicle program, scale back missile defense to focus on medium and short-range missiles, and halt construction of the latest generation of Navy destroyers. It would also increase spending on the F-35, an even more advanced fighter than the F-22, and keep the current 11 aircraft carriers in the U.S. fleet until 2040, when the number would drop to 10. To beef up the military’s unconventional capabilities, the budget proposes to spend more on training crews for flying and maintaining unmanned drones and helicopters, building new Navy vessels designed to operate closer to shore, and training more special operations troops. Taken together, said Tom Donnelly, a defense strategy expert at the American Enterprise Institute, the recommendations represent a modest rebalancing of Pentagon priorities to increase unconventional capabilities. But he said it appeared the recommendations were driven more by the need to hold down defense spending than by meeting the requirements of future hybrid wars. The danger, Donnelly argues, is that what the Pentagon ends up with is not adequate either for the conventional or the unconventional threats the U.S. would face in a war against a foe like Iran.